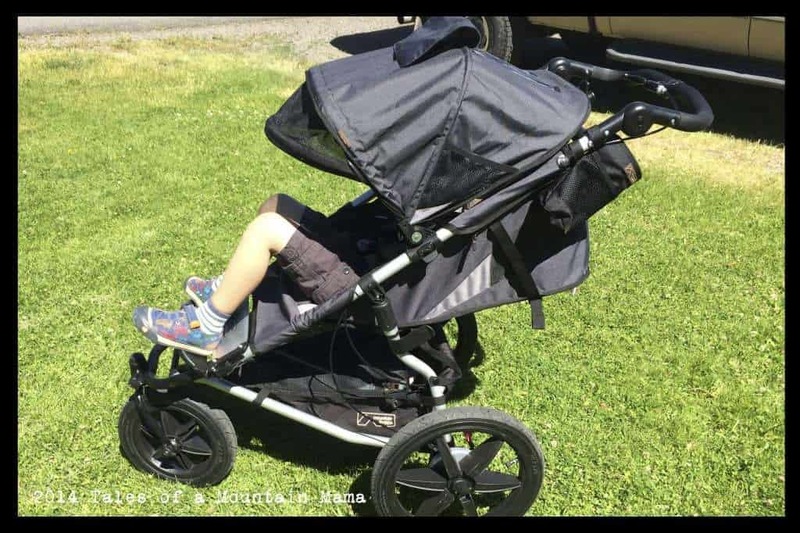 : For our “Stroll On: Get Out on Wheels” project this summer, we approached a variety of jogging stroller companies for reviews. Each of these strollers were given to use for their review purposes free of charge. However, we pride ourselves in having thorough and honest reviews – everything you see here is our honest opinions and exactly what we tell family and friends. 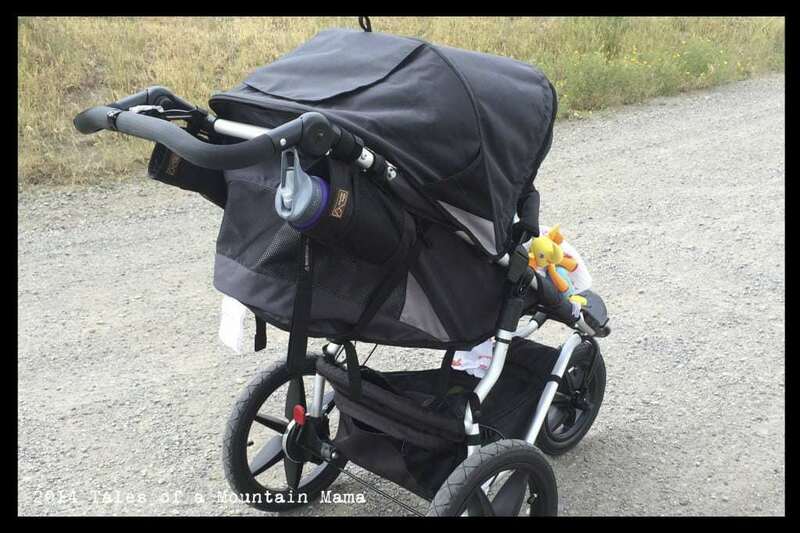 I’ve had my eye on the Mountain Buggy line of strollers for years now, ever since they were strongly recommended to me from someone who specialized in baby/kid gear. However, no one I knew owned one, so I wasn’t able to get my hands on one until now. 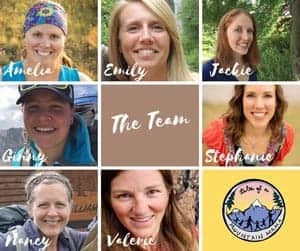 Mountain Buggy isn’t a new company – they’ve been making strollers and baby gear for over 20 years. 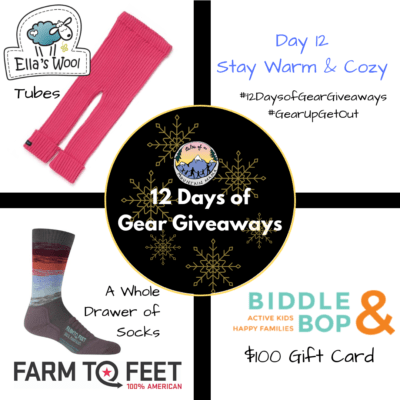 Their gear has evolved and grown to keep up with the modern family (and the gobs of great gear out there now for active parents.) The Terrain is their jogging stroller for serious runners. They also make lightweight city strollers, trail strollers (without a focus on jogging) and double strollers (both side-by-side and inline). 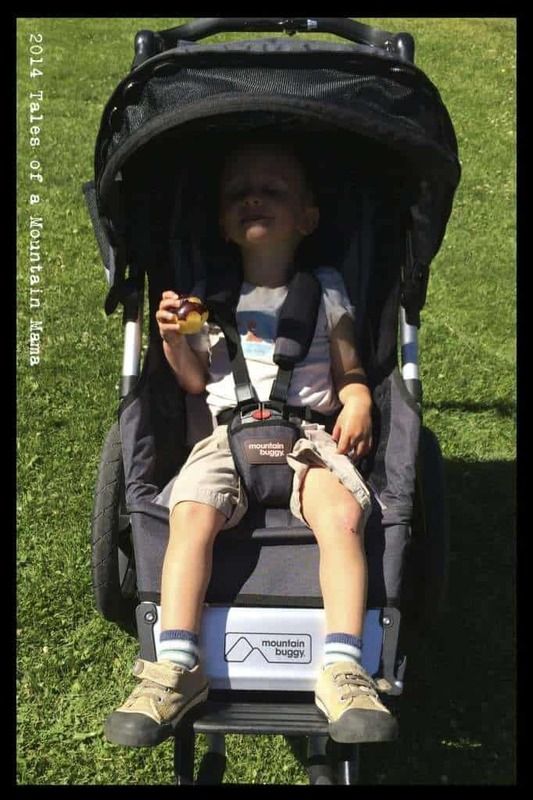 The Mountain Buggy is unique also because it has the option of completely changing the configuration by turning it into a bassinet-style or rear-facing seat by adding accessories. It definitely makes the stroller even more versatile. Right off the bat, it was love at first jog with this one. I loved the way it felt, the way my baby/child sat in it, the pockets, organizer, the suspension and the ride. I was seriously head-over-heels within a mile. However, like all gear testing, just one mile wouldn’t cut it. I used it, sent it to a friend to use and test (and help me review) and then got it back and realized I had some major adjusting to do. Things weren’t as I remembered which was no fault of my friend, but simply USE and exactly what we need to happen when we are testing strollers. 1. Ensure that the front wheel is locked inwards so the wheel faces backward on the buggy. This creates a smaller footprint for the buggy and centralizes the weight load, it should create a smoother ride on flat surfaces. 2. Inflate all tires to 22psi. At the correct pressure, the tire should feel very firm when you press down on it. Most good bike shops are able to check your pressure for you free of charge or pressure gauges are readily available at most department stores. 3. Adjust the tracking device. The tracking device on the front of the terrain is designed to push the front wheel slightly off center-straight. 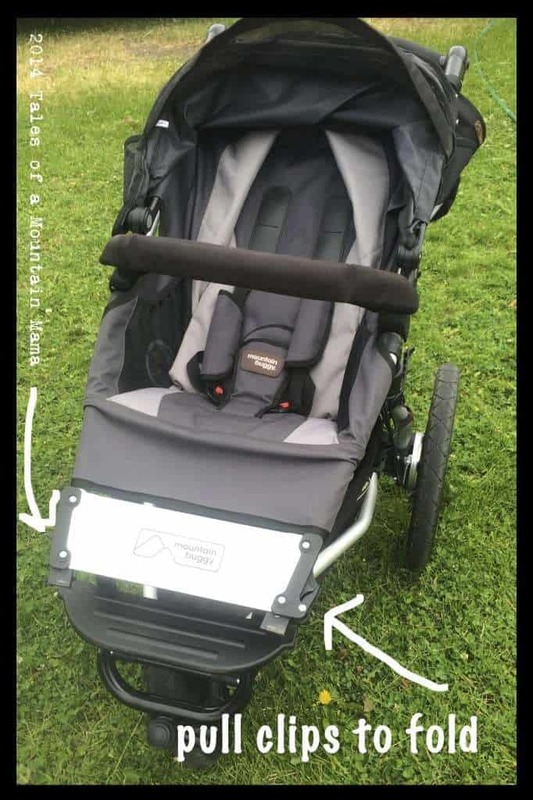 This would be used when there is an uneven weight distribution (causing a lean or counter-steer) on a stroller that pushes it to one side or the other. This would also be used to keep the stroller going straight if one of the rear tires is running low on air pressure. The tracking device is very easy to adjust to your desired position. With the wheel in a locked position, loosen the front axle with the two tri lock knobs on each side of the wheel. The tracking device is a lever located between the tri lock knob and the front wheel fork. Once the axle is loose, this lever can be pushed in either direction to cause the front wheels position within the front fork to angle slightly to your desired direction. When the wheel is where you like to fix it into place, hold the lever in place while you simply re tighten the tri lick knobs on each side again to lock the wheel in place once again. This can be done with the wheel locked in either a forward or rear facing position, but a rear facing position will allow less play in the steering. 4.Above the front wheel there is a bush nut cap. Under this cap there is a nut that holds the front wheel forks onto the stroller. This nut can be loosened or tightened slightly (quarter of a turn) to allow the front wheel to swivel more freely or track tighter depending on the need for each individual. If this is loosened too much, the front wheel can develop a wobble, so this should be loosened in small increments, the same is true for tightening too much. – Smooth Ride for miles – the 16″ tires are great for this. 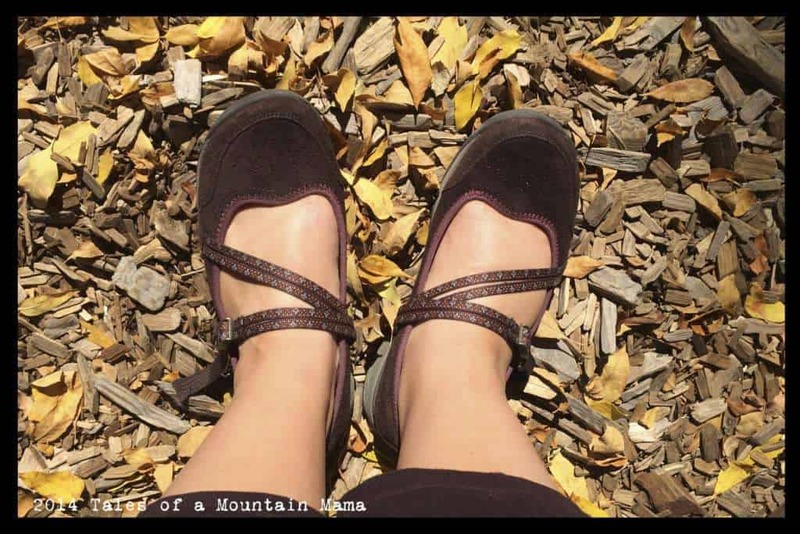 NOTE: You can replace those tires with a 12″ set ($65) for urban strolling or travel. 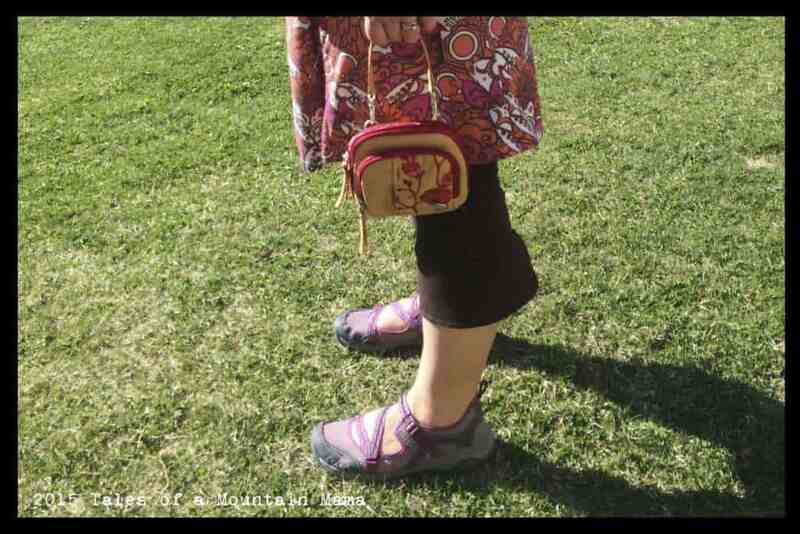 – The pockets and pouches. There are mesh pockets both on the inside by the child AND on the outside of the canopy on each side. Perfect spots for my phone, a snack, toys, sunscreen, etc. It also has two water bottle holders. 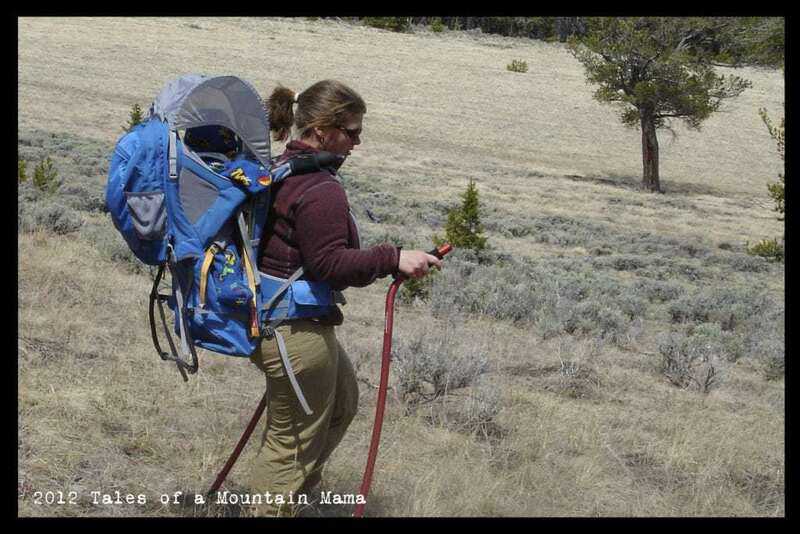 I usually use one for my water and the other for Bear Spray (oh the joys of living in Yellowstone…) or the kids’ water in the middle of the summer when wildlife aren’t as threatening. There is also a small zippered pocket on the outside of the cargo space on the bottom that is great for important items that need to be more discreet ($$, keys, etc.) Finally, if you don’t have much gear in the under cargo, you can zip up the mesh top so nothing falls out. – The backrest releases to lie completely flat, ideal for newborns and sleeping children. While I don’t recommend running with a newborn right away (because of Shaken Baby syndrome), strolling is great with no attachment needed. – The backrest/seat is super easy to adjust up and down. It’s simple straps on either side so it allows you to place it at whatever height you want. 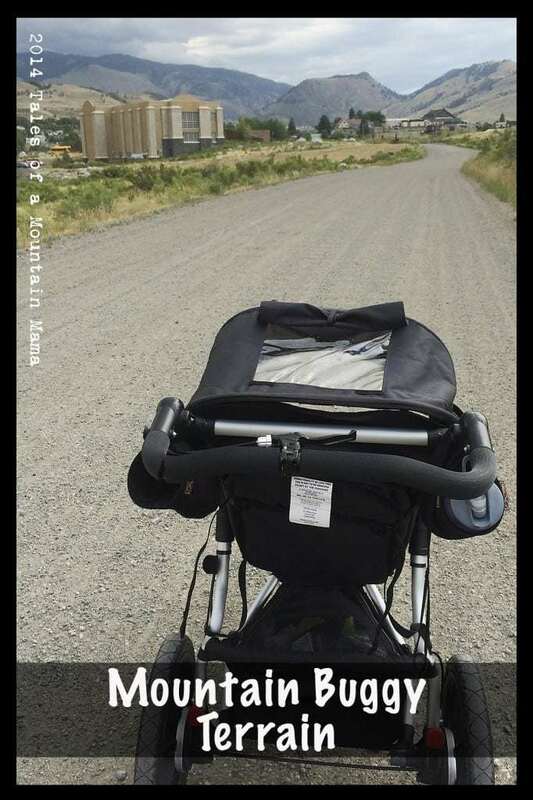 – The “Follow the sun” canopy means that it isn’t attached to the back of the stroller and you can be sure to keep the sun out of Baby’s face. It also has an additional few inches of “flick-out sun shade” you can use as needed. – The handbrake. On dirt roads and hills, it’s invaluable. – There is a “gate-opening” bumper bar that allows for easier in and out with big kids and comes completely off if you need the stroller to lay flatter. 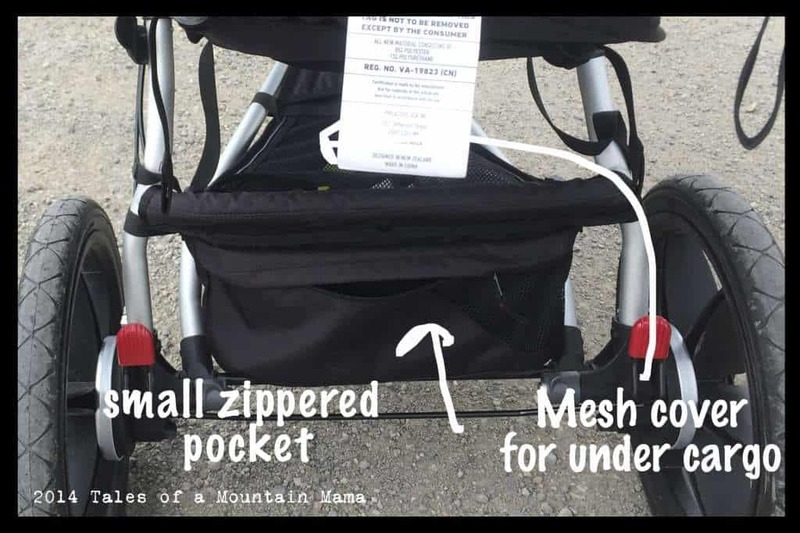 – It folds up very different than other strollers we have used (you pull on the clips near the bottom of the seat). Unless you release the wheel and have it under the stroller when folded, it can be a bit long. I like the way it folds, but it does take some getting used to! 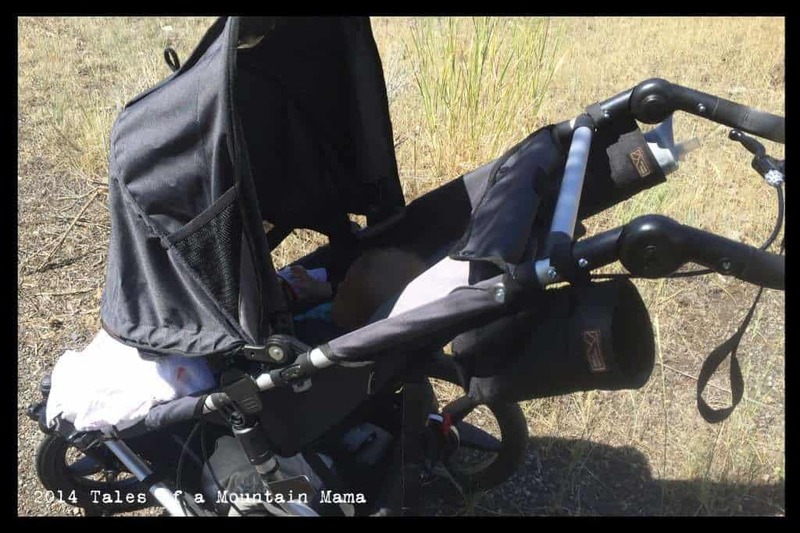 – While I love the feel of the handlebar texture, our stroller came with a small gash in it that has slowly opened up. It doesn’t affect my grip at all, but it’s annoying and I worry that it will tear all the way around the handlebar eventually. The rubber is very sturdy – it must have just gotten in contact with something sharp in transit. 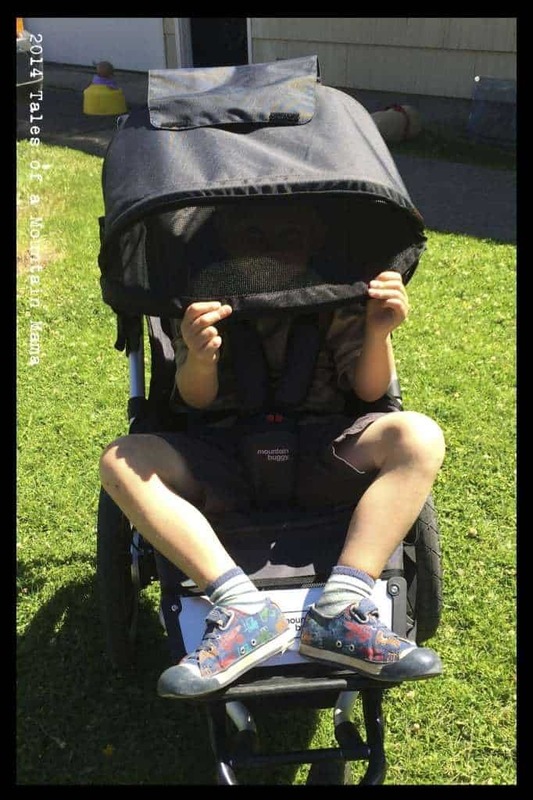 – While the stroller definitely still works for my 5 year old and it’s still easy to push his 45 pounds, the actual seat just barely fits him so it’s less comfortable. Most 5 year olds aren’t spending hours in a stroller, but it’s something to consider. Photos below should our 3 year old (who fits perfectly) and the 5 year old (who fits, but isn’t as comfortable). 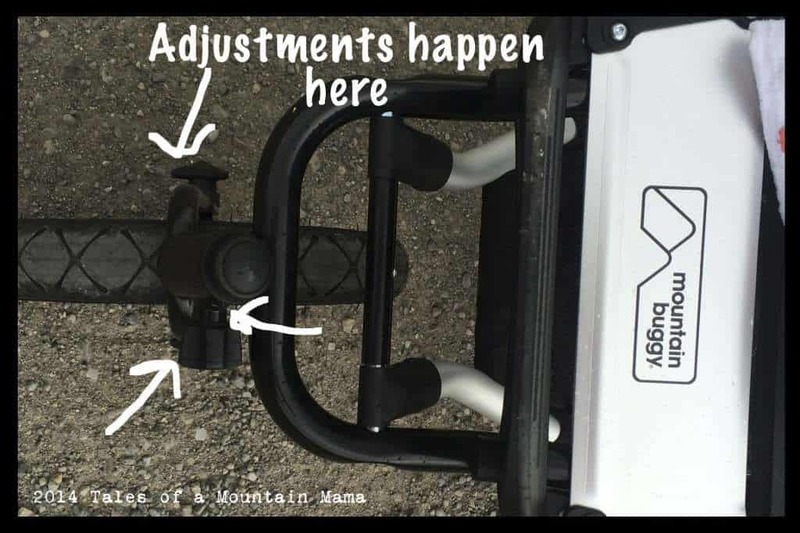 – It does take some adjustments sometimes to be sure the front wheel is inline correctly so the stroller is tracking as it should. It’s not uncommon and I definitely appreciate that I CAN adjust it, but it took some figuring out for me (see tips above). 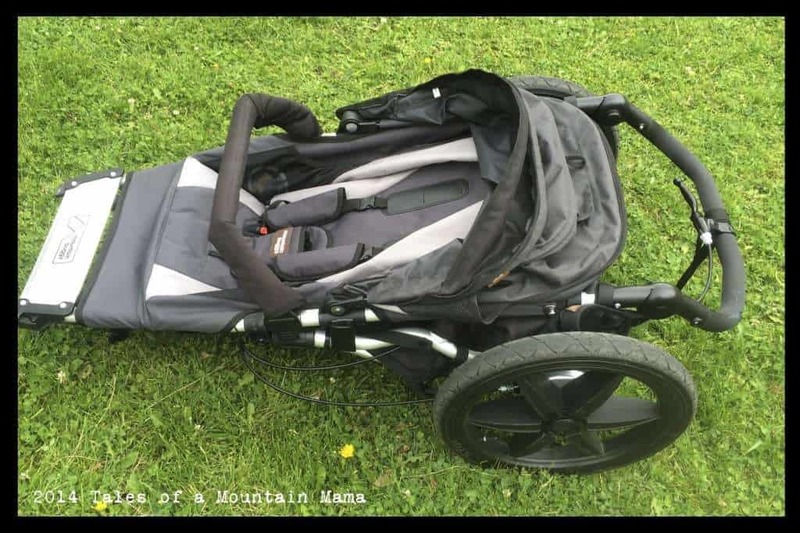 The Mountain Buggy is an excellent stroller for both serious runners and for someone who just wants a quality all-terrain stroller. The ability to adjust the tracking and manipulate the movement is key for a comfortable ride for all involved. I would love to see the seat just a little bit deeper to accommodate larger children who are still under the max weight. It certainly rivals the competition and is a favorite here!